At the end of a seemingly uneventful summer day, Britain’s King George III wrote the day’s activities in his diary: “J uly 4, 1776. Nothing happened today.” Oh, how mistaken he was! Something did happen that day. 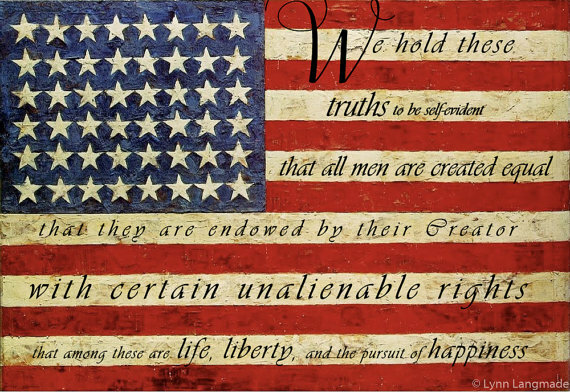 Fifty-six brave men pledged their lives to each other and signed their names to the Declaration of Independence. Of the fifty-six men who resolutely signed their names on the historical document, twenty-six were lawyers, nine merchants, six farmers, six physicians, two future soldiers, two statesmen, one planter, one surveyor, one shoemaker, one minister and one printer. Eighteen of the signers were under forty years of age, and three were in their twenties. The oldest was Ben Franklin, who was seventy years old. They declared to separate the thirteen colonies from the tyrannical rule and oppression of the King of England. These brave men, on behalf of their respective colonies, declared themselves to be free and independent from the power and authority of any other force than that of Divine Providence, whose protection they evoked. What those men signed was more than a document, but the destiny of a nation. As soon as these men penned their names on what is now a document that is two-hundred and forty-one years old, they immediately made themselves traitors to England. An agonizingly long, bloody and horrific battle(s) ensued before the fruits of the Declaration of Independence yielded bountiful results. Many lives were lost in the American Revolutionary War, and not one of the 56 men who signed their names escaped the struggle for independence without suffering grievously. What happened to those 56 men who signed the Declaration of Independence? Five signers were captured by the British as traitors and were tortured until they died. Twelve had their homes ransacked and burned. Most lost their businesses and their livelihoods taken from them. Two lost their sons serving in the Revolutionary Army. Another had two sons captured. Nine of the 56 fought and died from their wounds or from the hardships of the War. They knew the possible consequences and penalties that awaited, yet they signed anyway, pledging their lives, their fortunes and their sacred honor. One truth is certain, freedom was and is not free. For that one prize, freedom, these men signed a declaration and suffered horribly. Two-hundred and forty-one years later we must not forget the price paid for freedom nor forget the spiritual and political heritage of the birth of this nation. To forget our heritage is to head down a road that will eventually lead us away from liberty back unto tyranny. In a day when political correctness sees patriotism as offensive, it is a position that will find liberty being swallowed up in the quicksand of weakness and cowardice that will lead to loss of freedoms. One can’t help but wonder in the day in which we live where so many want something for nothing; who feel like they are owed something without earning it or sacrificing for it; who don’t believe in personal responsibility; who contend there are no eternal principles on which to base one’s life or govern society; would such individuals pay one-tenth the price those 56 brave men paid for freedom and liberty? The answer is self-evident. As we pause to celebrate the birthday of this Nation, let us not forget the sacrifice and commitment of those fifty-six stalwart men. While our Forefathers battled the British, we today are waging a battle for the very soul of America. It is a battle of greed versus sacrifice, spiritually versus secularism, God versus godlessness, good versus evil, decency versus indecency, right versus wrong, principles versus political correctness, responsibility versus irresponsibility. To the observing eye, that for which the signers of the Declaration of Independence gave so much, appears to be slowly slipping away from you and me. The freedoms for which our Forefather fought and sacrificed for demands that we never yield to the tyrants of vice over virtue, for when we do we will discover the brave signers penned their names in vain. May it not be so. Have Blessed and Safe Fourth of July.